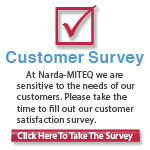 L3 Narda-MITEQ frequency converters are designed for advanced satellite communication systems and are available for a wide variety of frequency plans. Phase noise, amplitude flatness and spurious outputs have been optimized to provide the user with a transparent frequency conversion for all video and data applications. They offer ultra-low phase noise meeting an integrated phase noise specification better than IESS-308/309. All converters include Ethernet, RS485/RS422 remote interface with optional RS232. RF, IF, and LO monitoring points provided on the front panel. Date and time stamped event logs also included. Refer to the datasheets (D-326 and D-338) below, for more information.